Enter to Win $177 Worth of Removable Wall Decals of Your Choice from My Wonderful Walls! I'm excited to introduce you all to My Wonderful Walls. They offer imaginative wall stickers, wall stencils and canvas wall murals for kids' room and baby nurseries. Even better, it's all created and manufactured in the USA! My Wonderful Walls is a modern day Mom & Pop online retail business operated by Michael and Stephanie Goins. 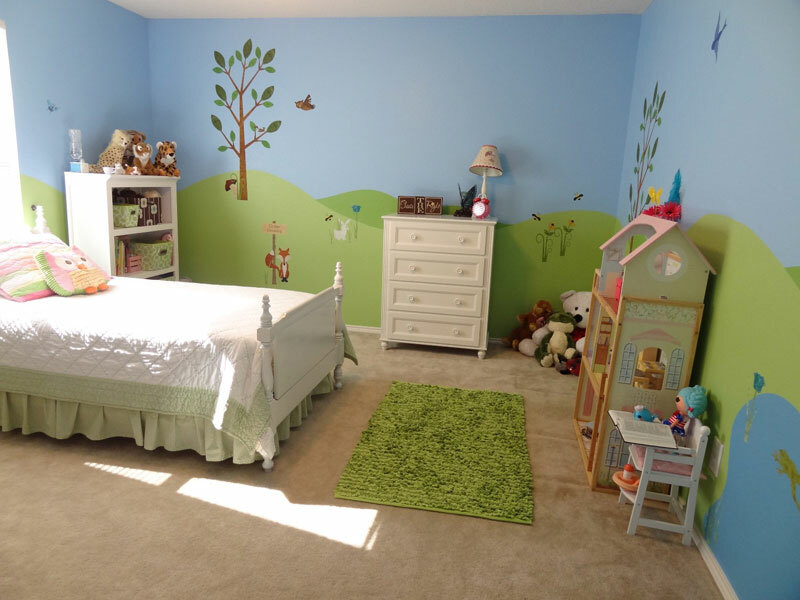 The idea for the company was born after Michael hand-painted a mural in their older son's new room. We knew that other parents would really enjoy doing this, but most lack the artistic training and/or confidence. So we decided to design products that would allow all parents (even the artistically challenged) to create wall murals themselves. We formed My Wonderful Walls in 2008 with a mere four wall stencil kits, and now we carry hundreds of popular product and ship all over the word. Each and every one of our products is designed and manufactured with tender loving care in the USA in beautiful Chattanooga, Tennessee. Heather from Full Price? Never! got a chance to review the wall stickers for her toddlers room! Here are her thoughts: "I am not a creative person, I wish I was but I've come to terms with it. I was so excited to try the wall stickers because even someone like me that lacks artistic skills can use them with terrific results! I'm always looking at my daughters boring closet doors and trying to think of someway to make them more fun for her... I finally found the answer! The stickers were very easy to use and absolutely adorable! The toddler agrees! The only problem I had was choosing from all of the themes they offer... farm, flower garden, transportation, jungle, dinosaur, princess, bugs, forest, fairy, cats & dogs, outer space, pirate, owls, dragon, monsters, circus, bugs, ocean, polka dot, clouds and more!" I've joined the host, Full Price? Never!, to bring you this awesome giveaway! 1 lucky winner will win any one item of their choice from My Wonderful Walls. This includes free shipping and is valued at $177! This giveaway is open to those with a continental US or Canada mailing address. To enter please use the form below! I love the removable wall stickers that kids can peel off and re-stick in their own design, and the canvas wall art! Flight of Dragons Wall Sticker Kit is my favourite. I like the “Under the Sea” Theme – Ocean Wall Mural Stencil Kit. I like the mural stencil kits. Would be fun to redo my daughter's room! Love the Wall Sticker Kits! I love the Princess wall stickers for my little princess! Love the fairies and mushroom! I love the canvas wall art! I really like the Bugs and Blossoms! I love the animal wall stickers! I like the Paws Park stencil kit. I like all of their wall art pertaining to the sea animals. I like the Jungle Safari Kids Mural. Jungle Safari- they would fit great in my daughter's room! I love so many of them it would be hard to choose! The Bugs and Blossoms are my very favorite though. I like the Clouds Stencil. Thanks for the giveaway!! Lily & butterflys wall canvas.